UWC Changshu China was founded in 2015 as the first UWC in the mainland of China on the initiative of a UWC alum, Mark Jiapeng Wang. Since its opening, the College has grown considerably and is today home to 443 students. UWC Changshu China consists of Grades 10, 11 and 12 with most international students attending UWC Changshu for Grades 11 and 12. Chinese Culture - Every student will take at least one Chinese course, be it language, literature, or culture, creating an immersive environment of Mandarin Chinese as well as a rich Chinese cultural context to support teaching and learning. Meanwhile, the Zhi Xing program (“learning by doing”) enables the exploration of the Chinese culture through interactions with the wider community. Youth Leadership - Many of the Zhi Xing activities have student leaders, who use their knowledge and experience to help their classmates to excel in these activities, acting as positive role models for their peers while also challenging themselves. Environmental Stewardship - Students participate in activities such as recycling, organic farming, and wetland protection, making a positive impact in the community. UWC Changshu China offers the International Baccalaureate Diploma Program (IBDP) curriculum, and a Pre-IBDP Program for Grade 10 students. The Pre-IBDP Program aims at allowing students to acquire the skills and knowledge needed for successful entry into the IBDP program. Within the IBDP curriculum, alongside standard courses, UWC Changshu offers foundation Chinese language programs (for international students), Geography, Economics, Philosophy, Global Perspectives, Chinese Studies, Theatre, Visual Arts, Spanish, French and German. UWC Changshu China named the Creativity, Activity, Service (CAS) program Zhi Xing, which means ‘learning by doing’ as well as ‘putting knowledge into action’. It enables the exploration of Chinese culture within the School and through interactions with the wider community. Many of the activities, such as Chinese performing arts, calligraphy, or Chinese musical instruments, have a direct focus on Chinese culture, allowing international students to understand Chinese culture holistically. Such activities also provide opportunities for Chinese students to share and further explore their own culture. Other activities, such as volunteering in local homes for the aged, schools and community centers, stretch the boundaries of our students’ education to include local Chinese culture, people and environment. Project weeks are an invaluable learning opportunity for the students, which allow them to put UWC values into action. Happening once a year, students get to explore a remote area of China. Members of the faculty lead IBDP students to less developed regions of China to participate in a week of public service. Students have the opportunity to interact with the local community through teaching, outreach and other community oriented activities. These trips also grant students insight into the different levels of economic development in China. Designed by Mo Ping, the protégé of I.M. Pei, the 24-acre campus is built on an island on the northwest side of Kuncheng Lake. 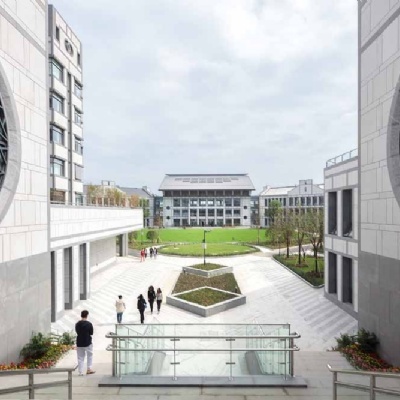 In architectural design, the campus is a reminiscent of a southern Chinese waterside village, where connections between all parts are seamless and unobstructed. The campus is also comprised of several cutting-edge technologies to enhance its sustainability and environmental friendliness, such as a geothermal heating system, rooftop solar panels, hybrid solar panel and windmill street lamps and other features. Campus facilities include: a multi-function performing arts centre; a state-of-the-art centre for wellbeing, with indoor athletic facilities, running track, swimming centre, yoga and dance spaces and outdoor sports ground, a basketball court, a football court, a beach volleyball court; a Science, Technology, Engineering and Mathematics (STEM) centre; a multi-function conference centre; residential houses for all students and faculty; a dining hall; a library. Changshu is a county city under the jurisdiction of Suzhou, Jiangsu Province, located 110 km west from Shanghai, in the heart of the Yangtze River Delta. IBDP applicants apply through their UWC national committee. Direct applications are accepted from Chinese citizens, residents of mainland China, and non-Chinese citizens who do not meet their own UWC national committee’s eligibility criteria. Pre-DP applicants need to contact the College directly. For more information, visit the website.